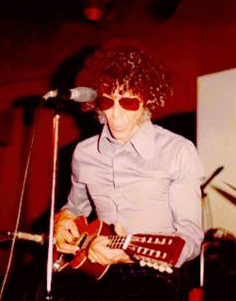 Born in Paris in 1928, austrian greek/turkish by his parents, Alexis Koerner lived in France, Switzerland, North africa and finaly reach London in 1940 were he felt in love with the blues during the blitz ! 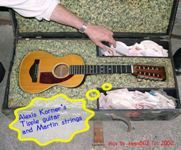 "The one Martin guitar that did capture Alexis’s imagination was the Tiple, a small ten-stringed ukulele-like instrument with a stretched neck and overgrown headstock. 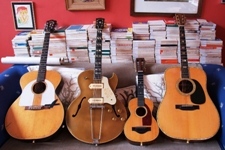 He’d first been drawn to its sound on 1930s country records by artists such as the Carter Family, and asked the London guitar dealer Ivor Mairants to find him one. It took ages, but when Ivor finally delivered, Alexis worked hard on mastering the instrument. With the likes of Page, Clapton, Hendrix, Beck and Kossoff all jostling for attention in 1960s London there was no sense in competing as just another guitar player. But by evolving his own unique style on the Tiple, Alexis could hold his own on any stage and in any company – and indeed put it to good effect when recording the Snape album at Island studios. As the UK’s foremost Tiple player he was in a class of one."